It can be a difficult thing to appreciate what our tradition of fencing stems from as we do not wear costumes nor hold boisterous feasts. Let me provide a little context. Two overlapping events frame our fencing squarely in the Enlightenment: the publication of Giuseppe Rosaroll-Scorza and Pietro Grisetti, La Scienza della Scherma and the first public performance of Beethoven's Symphony No. 3, Eroica. Our sword lineage derives principally from this era of thoughtfulness and beauty - a reminder of the great things that each of us are capable of. Our study of the sword, too captures this potential when we remind ourselves that the "beauty of the assault lies in the execution of its design". Whether you choose to continue to pick up the sword this year or not I invite you all to take every opportunity to design beauty in your life through the thoughtful execution of your reason. Starting an hour earlier will give us some flexibility for training and it will address schedule requests by our members. Many thanks to Benjamin Bowles at Benjamin Arms for creating this unique Italian foil for our Charitable Fencing Fundraiser! This is both a custom design and a first implementation of Mr Bowles' new Italian hilt - soon to be a favourite amoung Classical and Traditional fencers everywhere. All registered fencers able to compete in our formal assaults Saturday are eligible to win this prize. 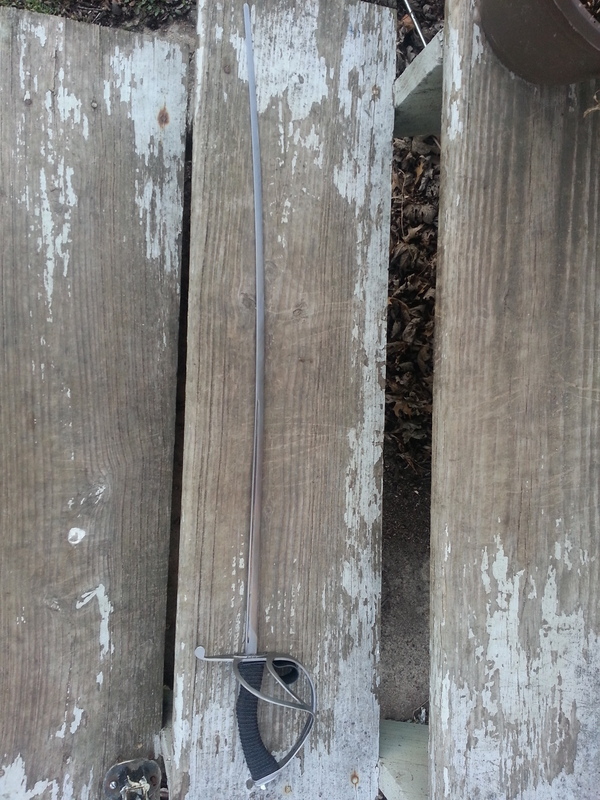 Dennis and I discussed making a sabre hilt like this for some time and during that process he raised an interesting question: how useful in training would such a hilt actually be? and yes, that is my right adductor pollicis which the very round and certainly blunt sabre point punctured with a sensation not unlike the squishing of a grape. The context is more revealing - I was not being attacked at the moment of impact. I was being tracked by my adversary's point, but it was my own forward motion which caused the injury. Take from that as you will. What I learn from this is that it was my fault for not perceiving the threat of point and forgetting my own approach to sabre play, viz. failing to defend myself by blade. But more questions arise from this situation. One, can we ever effectively armor the hand wielding a sabre? 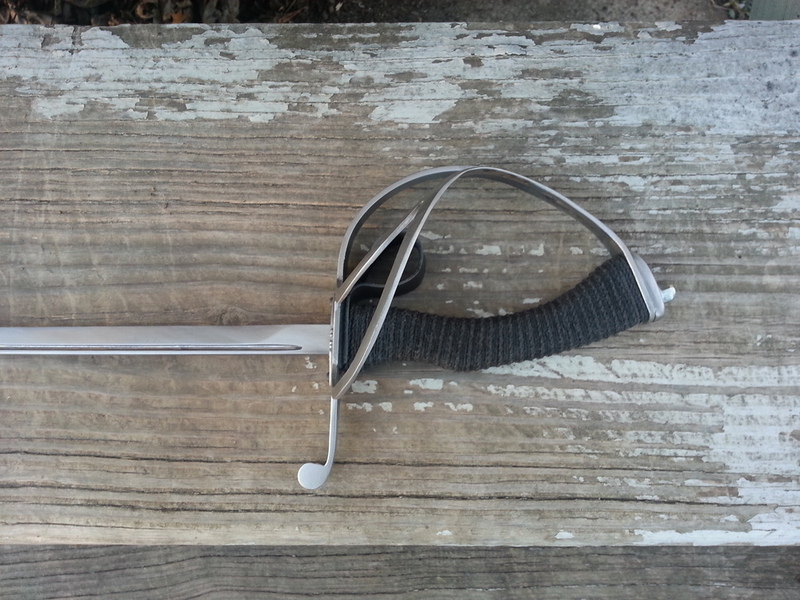 Two, can restricting sabre targets mitigate any danger that a minimal sabre hilt may present itself if the answer to Q1 is no and the fencer is unable to utilize the blade for all defense? I'm not sure what the answer to Q1 is. I know that there are many products now in the larger HEMA/WMA community that at first sight appear to do so. However, when we look more closely at these products they are built with an almost singular attention to impact of percussive blows and not thrusts. This leads me to presume that we do not yet have adequate hand protection. If anyone would like to build a sabre glove with a butcher's mail sewn into the palm I think we'll get close. The answer to Q2 is certainly yes, provided that you have no qualms about how "real your fencing is". There appear to be more supporting reasons for a simple target convention than other more complicated solutions including, perhaps new armor. What this answer cannot address obviously are accidents - the very kind I am humbled to reveal above. Do I have the experience and skillset to have prevented this injury? Yes. Was it a lack of focus or attention to the real threat? Perhaps. Does this mean that we need to maintain the domes of steel, the excessive guards to simply play safely? Oh Teapot I sure hope not. Back in June Uriel and I were honored to provide a short distraction for the campers at Camp Notaclotamongus - an opportunity for children of all ages with blood disorders to experience a traditional Summer camp. Organized by the Gateway Hemophilia Association and held at the Living Well Foundation's beautiful 250 acre site in Imperial, MO, we were greeted by the enthusiastic faces of all the campers and their counselors. We fielded many interesting questions and did our best to bring a little bit of our swordplay to life. Photo credits to Zoë Achilleus. Mr Voelker and I were discussing aspects of our dueling practice in light of recent re-reading of Maestro Lurz's article which we recently serialized here at TDS. Often our conversations turn to how we define success in fencing and this is precisely where we found ourselves at the conclusion to another regular Saturday training session. Maybe this topic is of little interest to you, or perhaps it seems unnecessary. After all, is there not a consensus for what constitutes success in fencing? Most fencers never think about it, but rather unquestioningly adopt what everyone else appears to be doing. Touches for or against; fight to a specific number of touches or unlimited touches over time; allow some target and disallow the others. All of these variations have one thing in common - that the touches define the success. I brought attention to this quote in the last article for a purpose. Some fencers still not only fail to apprehend the importance of this fact, but some openly refuse to accept it when they fight. How can this be? I suspect that when fencers are free to define the nature of combat themselves rationalizations creep into what otherwise would be sound, technical swordplay. But this topic will be revisited another time. As we talked something occurred to me about scoring - which let me tell you we labor over and never take lightly. Usually, in Classical Fencing (what we consider to be the modern weapons of foil, epee, and sabre), corps a corps is proscribed in combat. This convention exists principally for two reason. Therefore, all of the auxiliary sword technique such as off-hand parries, locks and grapples are typically barred. For this reason many fencers are surprised to learn that these techniques even exist, let alone represent sound tactical choices for their combat. Along this line of thought then necessitates a consequence for both the corps a corps and any resulting dis-arm. The former is a simple matter often resulting in nothing more serious than a halt in action and a potential warning. The latter is more interesting. Typically when fencers lose their weapon it is due to the mechanical leverage applied by their adversary which changes their grip. Sometimes the leverage is accidental - a strong line well established can unintentionally disarm a fencer. Sometimes the leverage is purposeful - as the deliberate disarming techniques accomplish. In both situations (provided that the conventions for the fight allow) it is normative to halt the fight and re-arm the fencer. But what does this say about our swordplay and further, what it means to be an effective fencer? It makes an excuse for losing your grip - and that is not good fencing (technically nor tactically). Sometimes, within groups that recognize this problem, the disarm is equated with a touch in terms of the consequence for the fencer. You disarm me and I suffer the implication of having lost my grip/sword by accepting a touch against me. This certainly provides a real incentive in scrutinized fights (tournament play) to prevent the disarm from happening. But is a disarm the same thing as a successful stab? When we consider the medical facts about what we are likely to experience when stabbed or cut can we accept a disarm as equal in consequence? No, we cannot. So what can we do instead? We can use a real consequence for the disarm - you lose the fight. Next you might learn the various actions which potentially disarm your adversary - expulsions, sforza, beats, etc. that exist within the context of blade technique rather than off-hand actions. These off-hand actions might also find their way into your training. But be mindful, for if your training does not include possible counters to these action you will be unable to forge a meaningful contrary action and keep your grip. If I introduce an action like a disarm in a lesson I am careful to also include at least one counter to it. It is important that new fencers leave training understanding that actions have contraries and not to put too much stock in something that appears unbeatable. In the former case it is reasonable to allow the disarmed fencer to make an attempt to re-arm themselves and re-enter the fight. In the latter, the fight is over. Having lost your weapon you have no reasonable chance to continue your fight. Swordplay is complete. Mr Voelker decided that this form of disarm was a more difficult sword skill to demonstrate in combat. We concluded this conversation with a final exchange in which the definition of success was a disarm - which would finish the fight. The insight of M Lurz's thesis provided us intelligent context for this - successful thrusts could still be made, they would just not define how the fight would conclude. Unbeknownst to us, Mr Capstick was capturing this final exchange and we present the video record here. Mr Voelker in white jacket and D Achilleus in grey. Swords are Italian spada d' marra (made by D Graves) and the entire body is target. Our good friend and CFS Milwaukee Instructor Sean Newton came to STL for a visit and we captured some of our time throwing steel at each other. Sean has been working for years on the sabre and has excellent ideas, both technical and tactical. This footage is raw and has no audio, but does give a good idea about how we wield the dueling sabre. There are curricula and even entire pedagogical systems to model; there are books, contemporary and historical from which to glean technique and definitions; there are teachers and instructors and masters to supplicate to - and far too many who expect you to do so. At the end, fencing makes sense, it is inherently logical, and must therefore be discoverable and universally true. This discovery can be on your own (the autodidacts) or shared with others (perhaps even those deserving of your supplications). While there are pitfalls in store along either route our purpose here is in another direction, viz. how do I train fencers? The Trivium was foundational - necessary information for the student to proceed in their studies. It was never an end to pursue, but rather the key with which to unlock more knowledge. Sword science utilizes this sequence effectively. Grammar becomes for us the Technical information. What is an attack? How are attacks developed, executed and defended? Essentially the ‘what’ of fencing. Logic becomes for us the Tactical and scenario based information - the conditional clauses that provide context and meaning. Essentially the ‘why’ of fencing. Finally, Rhetoric becomes for us actual simulated Combat - free and spontaneous - the true communicative form of our science (essentially how our science becomes art). 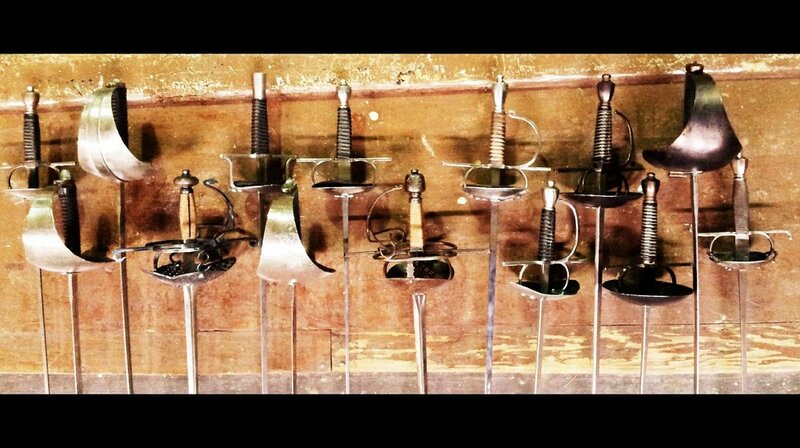 As the Trivium is sequential, so too the order of sword training. Students begin learning a vocabulary - both in English and in body mechanics which expands to include blade actions. Altogether these movements, carefully constructed and repeated, become the working nuts and bolts with which fencing is built. Once the student can move and speak with the new vocabulary they need to learn why these nuts and bolts work. Armed with the logic of fencing the student is empowered to not only understand, but to continue to decipher and more accurately solve new problems which their opponents will attempt to confound them by. Ultimately, the student must surrender to the stress and uncertainty of combat. Only in this sacred place will the distillation occur: form subdues formlessness, logic dispels uncertainty, and experience makes action effective and effortless. For these reasons it is understandable how the characteristic, sang-froid, has been used to describe our antecedent sword bearers. It is the appeal to reason, rather than emotive power, that the fencer acts and succeeds. Swordsmanship is less concerned with possibilities than it is realities, so we simply substitute ‘hypotheses’ with ‘solutions’ - specifically, those that protect us against a known adversary. Even so, we could consider the development of the aforementioned hypotheses as useful as we consider possible technique and combat scenarios. Would this alteration of a technique work and why or why not? How does this scenario manifest itself among random combatants? The method feeds the inquiry which then feeds back into the method. More can certainly be said about standards, conventions and choosing the content - material appropriate for the next article.